The show of the book of the twitter account. Such multiplatforming! A warm, intelligent comedy show celebrating the Irish Mammy and providing a gentle but accurate poke in the ribs to the oddities and quirks of Irish life. It’s relatively clean, though not sanitised, and suitable for most of the family depending on their bedtime or sense of humour. It’s been done for fundraisers, in big and small theatres around the country, snippets of it have featured at awards ceremonies. in New York, London and Paris in front of three different ambassadors and other people with fairly good jobs, doctors and actuaries – that kind of thing. 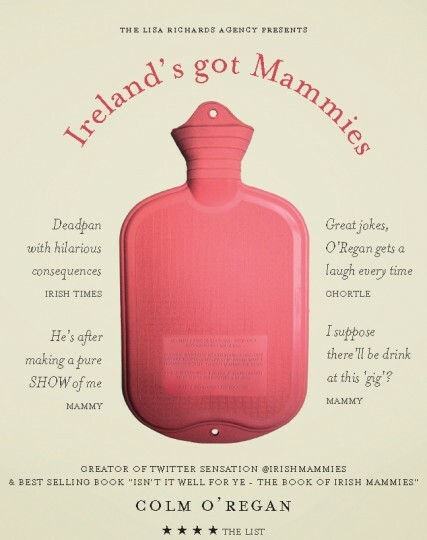 If you are interested in booking the Colm for the live stand up comedy show Ireland’s Got Mammmies, please contact the Lisa Richards Agency. You can call + 353 1 637 5000 or email info@lisarichards.ie.